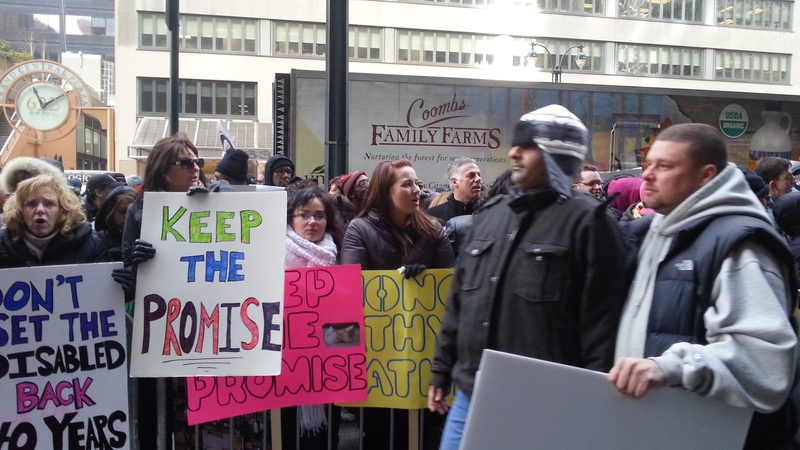 NEW YORK, March 15 – Shouting “Hell No, Cuomo,” and “Governor, Have Some Guts, Restore the Cuts,” several hundred people with developmental disabilities, their family members and the workers who care for them protested outside of Gov. 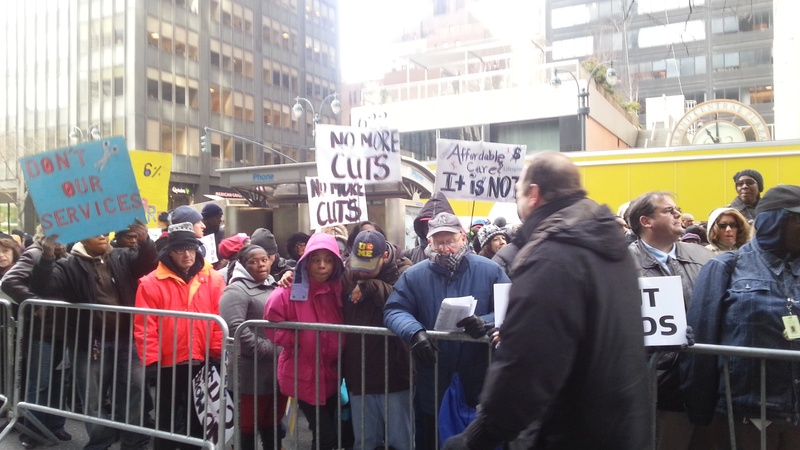 Cuomo’s Manhattan office Friday against his proposed $120 million cut in funding to the nonprofit agencies that provide critical services to one of the state’s most vulnerable populations. 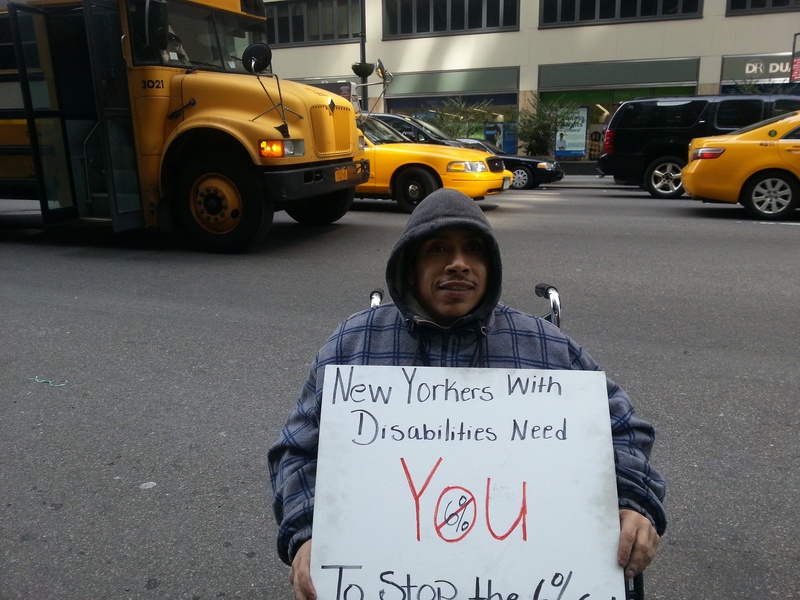 “I think we have to ask why is New York State launching an attack on people with disabilities, State Assembly Member Thomas Abinanti of Westchester County told the protesters. “The budget for the new New York reduces special ed, it blocks access to insurance provisions designed to help people with autism and it diminishes help for people with disabilities all to pay for income tax cuts for the comfortable, tax breaks for business and big subsidies for corporations. It’s not fair, it’s not right and it’s not New York.” State Assembly Member David Weprin also spoke at the rally. Gov. Cuomo has proposed cutting $120 million or six percent of the state budget allocated to nonprofit organizations that serve people with developmental disabilities. Because state Medicaid dollars are matched by the federal government, New York State’s $120 million cut would mean a total loss of $240 million in the coming fiscal year. The Democratic majority in the State Assembly and the coalition that controls the State Senate have proposed restoring the full amount of money that the governor is seeking to cut in their own budgets that have already been passed. Organizers of the rally said a final decision on the proposed cuts is expected some time next week. The New York State budget for fiscal 2013-2014 must be passed by the Legislature by April 1. Caretakers of children and adults with developmental disabilities and employees of the nonprofits that provide the funding to the caretakers expressed serious concern about losing their jobs. “The six percent cut is going to devastate our services, put people at risk and cost jobs, probably even mine” said Tracy Behling, who works for the Young Adult Institute (YAI) as a regional supervisor in Westchester, overseeing the staff and residents of 14 group homes. But the nonprofit agencies that provide the services refuted the governor’s allegations, insisting that the $120 million cut would have a devastating impact on all sorts of programs and services that they provide to people with developmental disabilities in New York State. “It’s a disgrace to take away services for our most vulnerable population,” said Donna Long, executive director of the Grace Foundation of New York and the mother of a grown child with autism. The six percent cut was triggered by a change in how the federal government plans to reimburse New York State for the care of people with developmental disabilities. Washington has alleged that New York has overbilled Medicaid for the institutional care of people with disabilities for over a decade, charging about $4,500 per person per day for people with developmental disabilities in institutional care while much of that care was deinstitutionalized, and much of this federal funding was redirected to other services for the developmentally disabled. Still, the end result of the six percent cut to the budget of the Office for People with Developmental Disabilities (OPWDD), which provides the funding to the nonprofit agencies that pay the salaries of direct care workers for the developmentally disabled and also offer their clients a vast array of other services including recreational and work programs, is expected to jeopardize the safety, health and well-being of this extremely vulnerable population, protest organizers said. Tell Gov. Cuomo and your New York State Senators and Assembly Members to immediately STOP THE CUTS to services for the developmentally disabled!! !